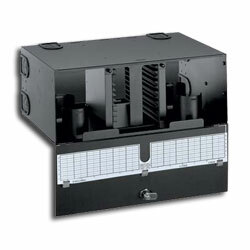 Opticom Fiber Optic Rack Mount Enclosure. Opticom (144) Fiber Optic Splice Enclosure. Holds up to (12) splice trays (FST6). Dimensions 6.83"H x 11.77"D x 19.0"W (173.5mm x 298.9mm x 482.6mm).